Connor Johnson, who started a petition to save NASA’s funding from budget cuts, meets Kennedy Space Center Director Bob Cabana and receives a special space memento. Six year old Connor Johnson has a dream to become an astronaut, and pretends to float in zero gravity at Kennedy Space Center Visitor Complex. “I will always remember talking to Mr. Cabana and getting the bolt. Seeing Atlantis was awesome. There was so much to learn and do,” Connor said. Six-year-old Connor Johnson stands amazed before space shuttle Atlantis, seeing her for the first time in all her splendor. Connor scans the orbiter from the tip of her black nose to the stretch of her tail, but stays still for only a moment. He runs ahead of the crowd in his bright orange space suit and remains captivated by the stunning spacecraft. He stops when he reaches the massive engines, raises his head and takes it all in. Although Connor will never fly in one of NASA’s space shuttles, he might become one of the first astronauts to go to Mars. Connor’s dream to become an astronaut developed around the age of three, according to his mom, Lauren Johnson. A few months ago, he demonstrated his passion by creating a petition to preserve NASA’s funding, and his drive is an inspiration to many involved with the U. S. Space Program. Since then, his endeavor brought him to Kennedy Space Center Visitor Complex in Florida where Connor and his family spent a full day on March 15 experiencing the past, present and future of the Space Program. During his visit, Connor not only met several space shuttle astronauts, he also trained like an astronaut. 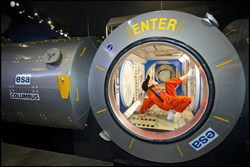 He received training from astronaut Mike McCulley at Astronaut Training Experience® (ATX®) where he landed a simulated space shuttle, spun on a multi-axis trainer and practiced moonwalking. Once he finished all the tasks, he was granted a certificate of completion signed by McCulley. “The training was super fun and I felt like a real astronaut,” said Connor after his time at ATX. Connor also explored the Robot Rocket Rally, a three-day event at the Visitor Complex showcasing the advances made in robot technology. He learned about NASA’s new crew capsule, Orion, and took home the tools to make a desk model of NASA’s Space Launch System (SLS) rocket, which is being developed to be the first capable of supporting deep space travel. One day, if Connor becomes an astronaut, he’ll launch to Mars aboard the Orion capsule. In addition to ATX and Robot Rocket Rally, Connor says his most memorable moments were visiting the Space Shuttle AtlantisSM attraction and meeting Bob Cabana, former astronaut and current Kennedy Space Center director, who presented Connor with a bolt from the International Space Station as a keepsake. Connor’s mom agreed. “It was an amazing experience for all of us. This is an exceptional place for families to have fun, learn and be inspired. You come and remember how much America has achieved in space and technology,” said Lauren Johnson. Kennedy Space Center Visitor Complex has always been an educational destination, and in recent years it has adapted new, interactive learning exhibits for all ages. The Visitor Complex strives to teach the importance of STEM (Science, Technology, Engineering, and Math) education to children like Connor in a fun and exciting way, an approach that Connor’s parents appreciate.